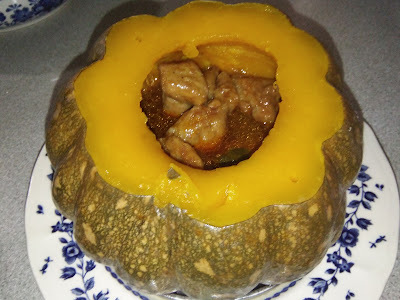 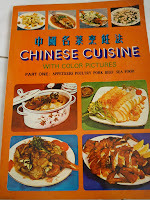 This is a traditional Chinese recipe for pork steak. 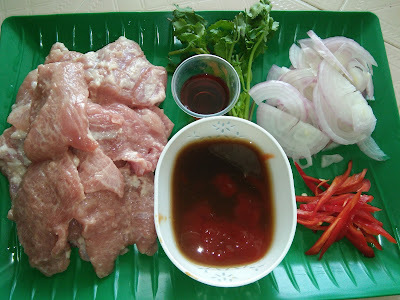 A very simple recipe with the main ingredient, pork that goes with a fragrant, tasty sauce consisting of the common seasoning ingredients. 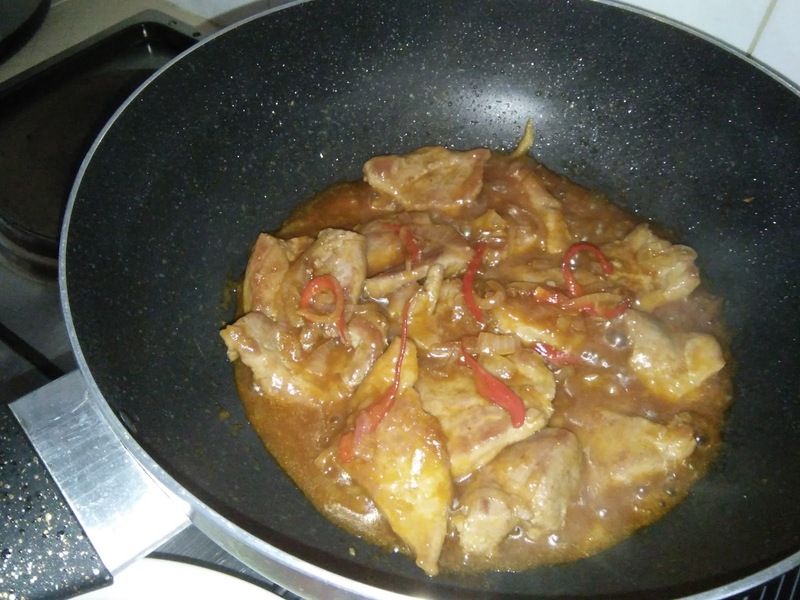 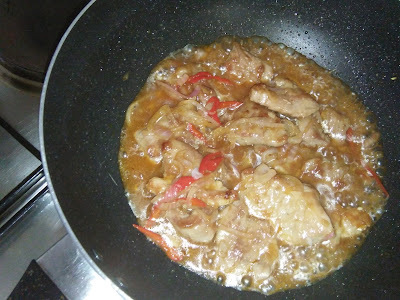 It is called a pork steak [Western] probably because Worcestershire sauce is used, if it is not then I supposed it is a sweet and sour pork. 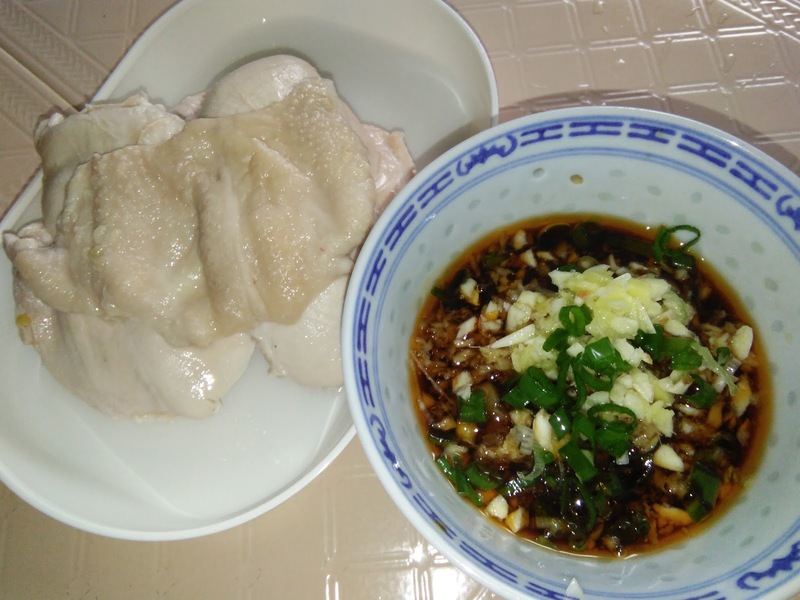 This dish reminds me of my mum's cooking, simple and tasty. Anyway, this is an appetizing dish. The meat slices are tender probably because of the marinade and tastes sweet, savoury and sourish with a tinge of Worcester sauce. 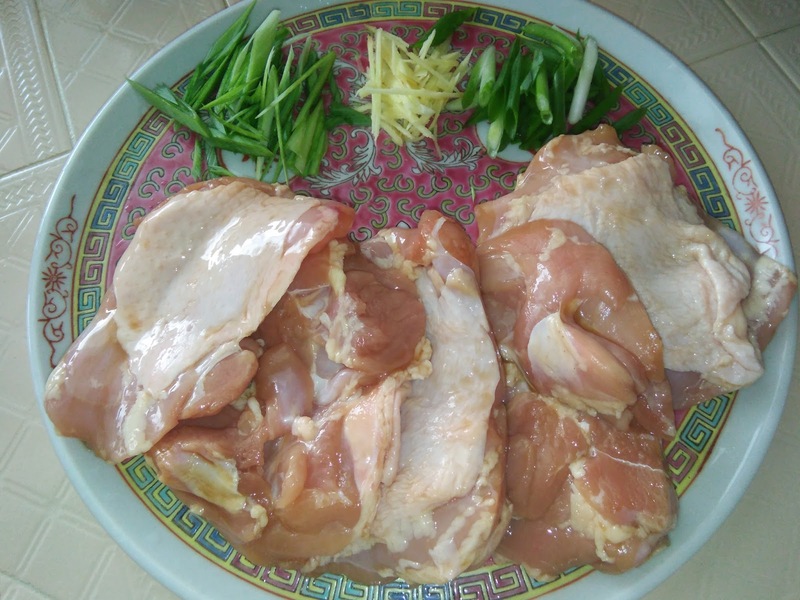 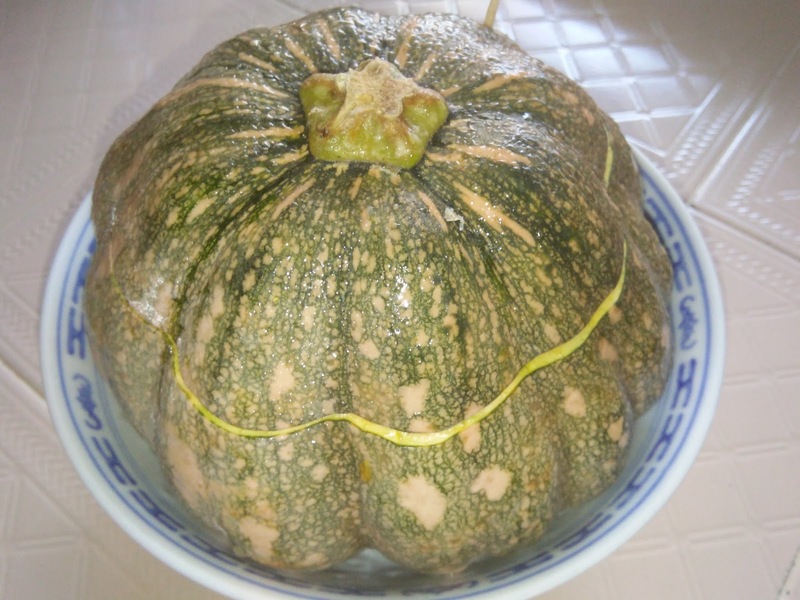 A lovely dish to serve with plain white rice and some freshly cut vegetables like cucumber, tomatoes or salad leaves. 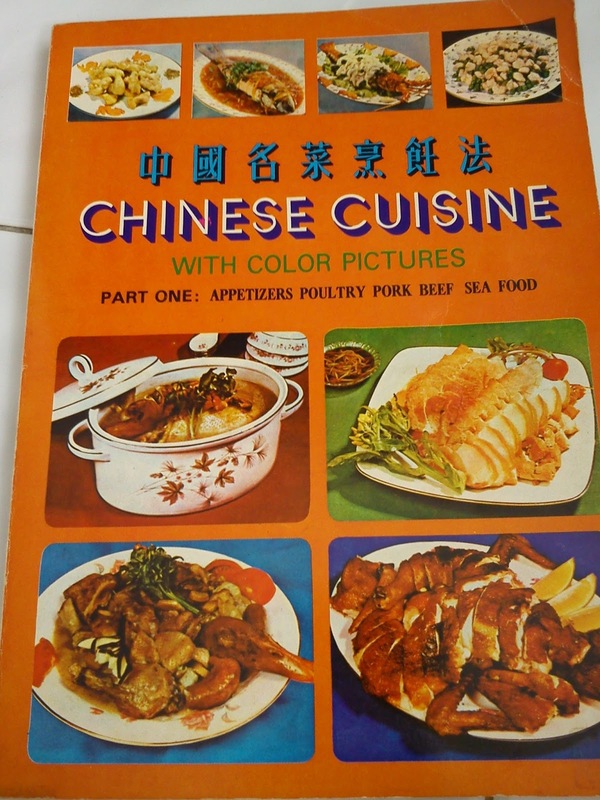 The recipes in this cookbook used Msg as seasoning, you can omit or substitute with other seasoning or reduce the amount. 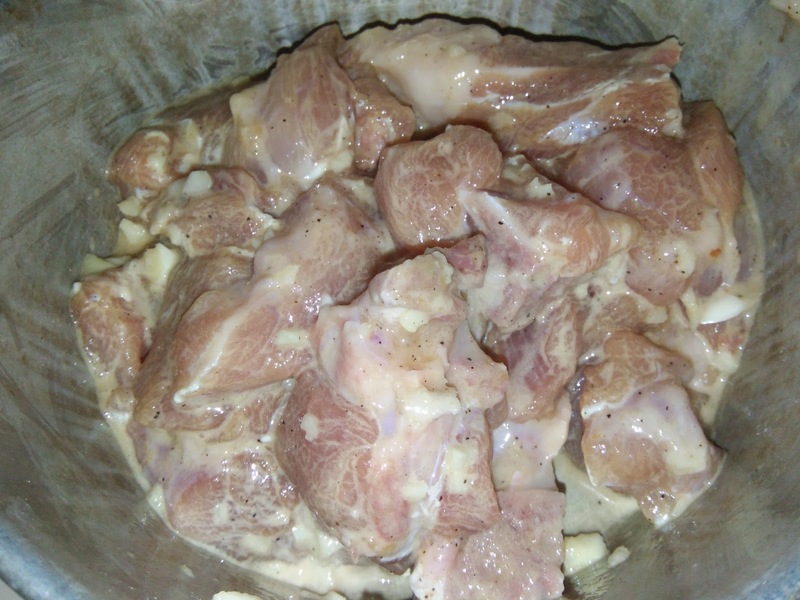 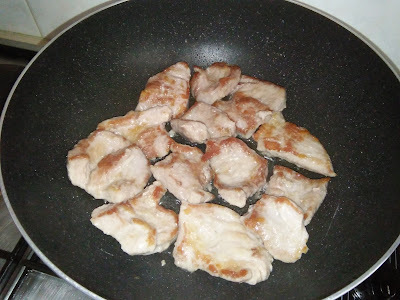 Marinate pork slices for at least an hour. 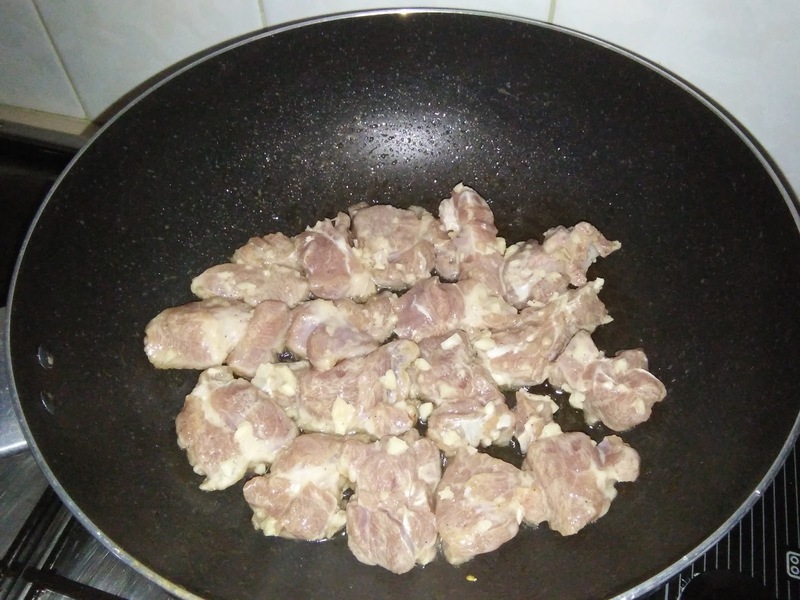 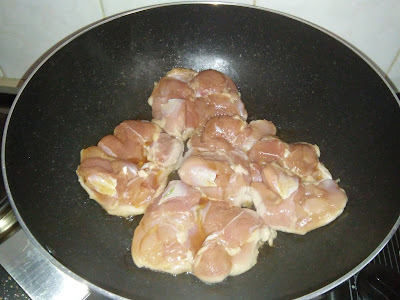 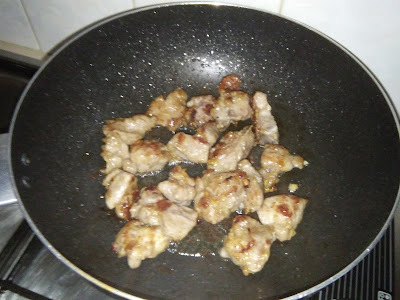 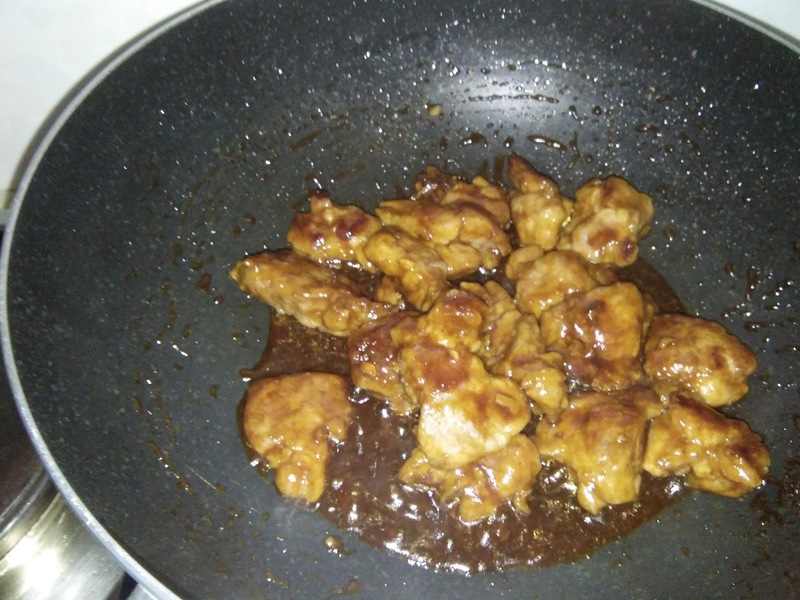 Heat a non stick wok with 1 tbsp cooking oil, pan fry meat slices until golden brown on both sides. 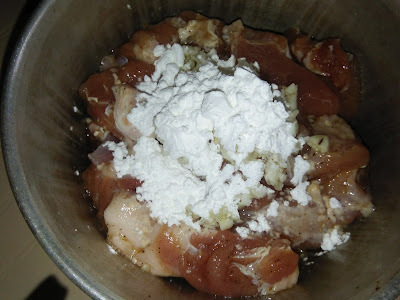 Add cooking wine. 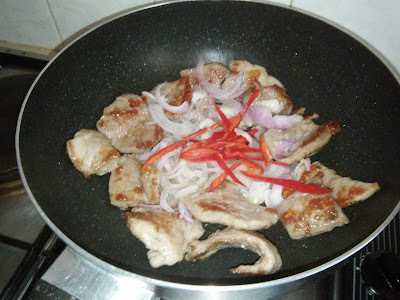 Push aside, add in onions and red chilli, fry until aromatic. 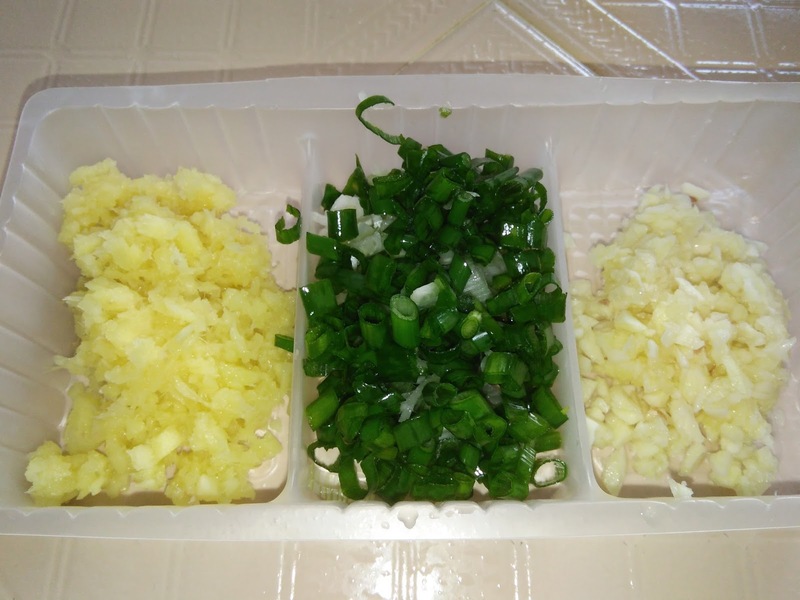 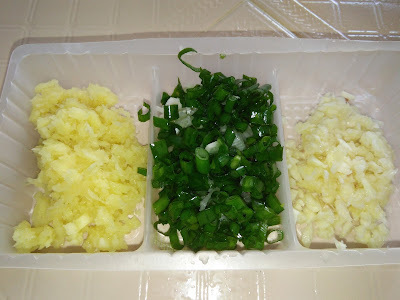 Pour in the seasoning sauce, stir fry to mix and coat well. 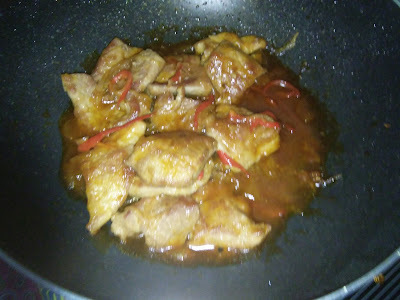 Simmer until sauce is reduced and thick. 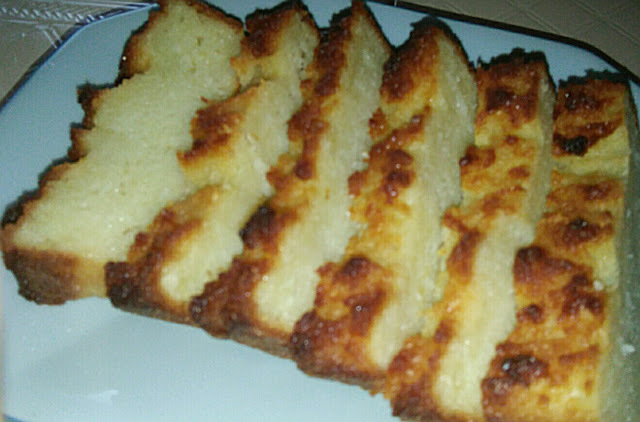 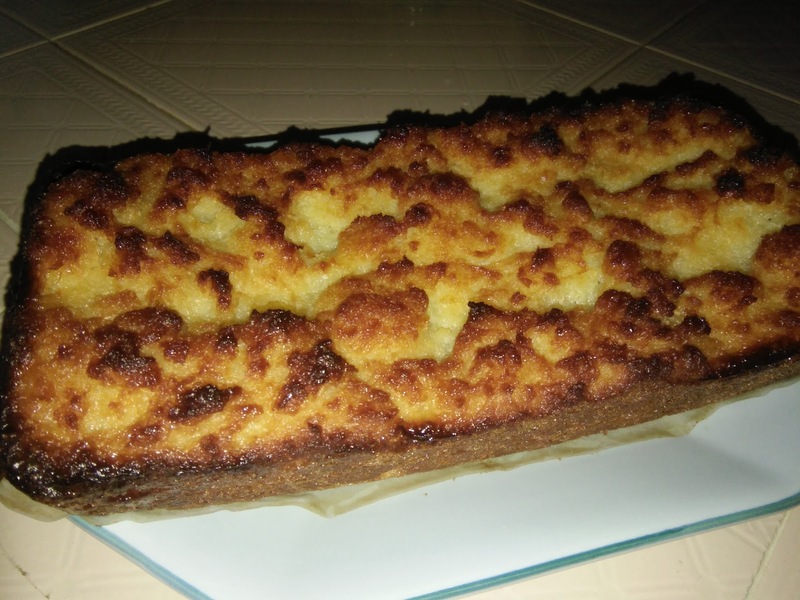 Baked Tapioca Cake aka Cassava Cake is my family and my favourite Kuih of all Kuihs. This recipe is quite similar to my earlier post on this kuih. 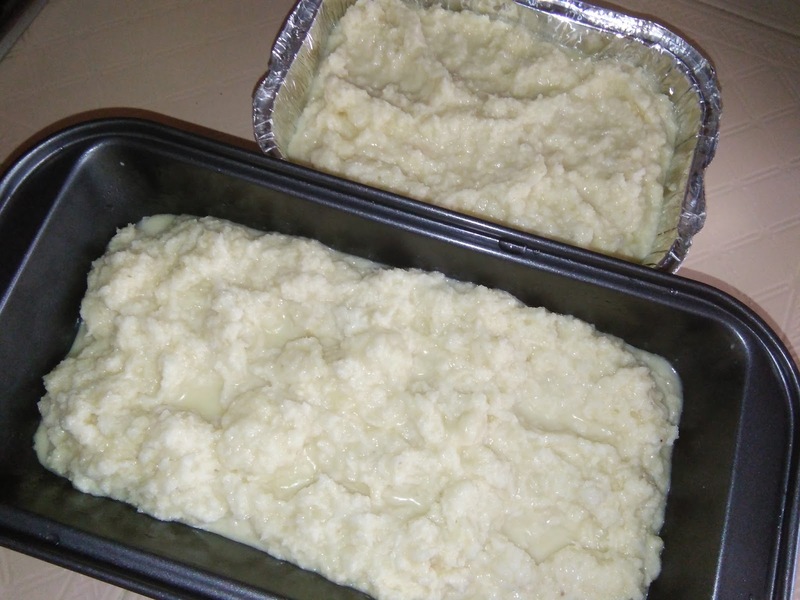 I was tempted to bake this kuih because the fresh tapioca was selling so cheap at Tesco for only RM0.99 cents a kilo. I have baked it in 2 portions in a loaf pan and aluminium foil as I intend to give away a portion to a relative. 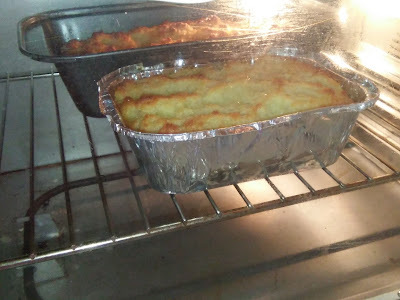 The cake should look tall and nice if I had baked it in a 7 inch square tin. The kuih is not too sweet and packed with grated tapioca. No flour is added and the sweetness is acceptable to me with the lovely aroma of grated tapioca. 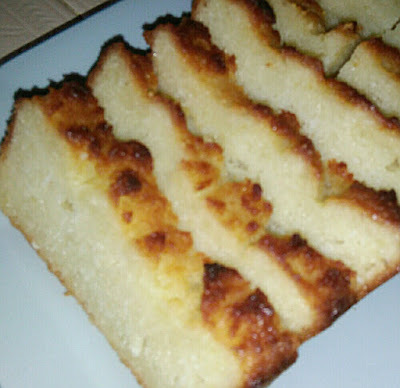 My hubby says it's nice and he can have more because the sweetness is acceptable. 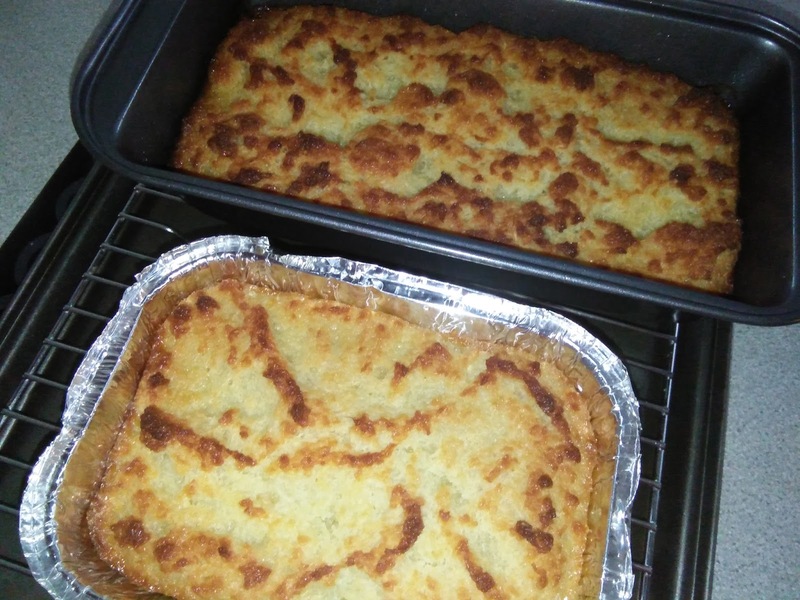 This is an easy baked kuih to make but the only tedious part is the grating. 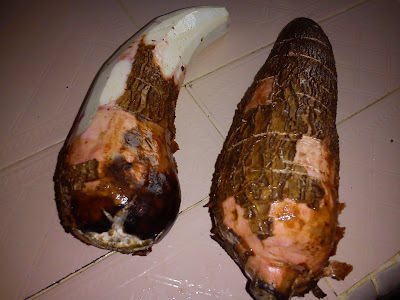 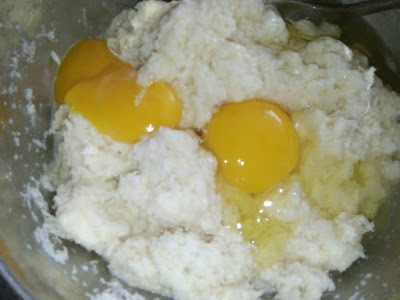 However, you can blend the fresh tapioca with a little water in the blender to form into a paste. Combine all the ingredients [except melted butter] until well mix and sugar dissolves. 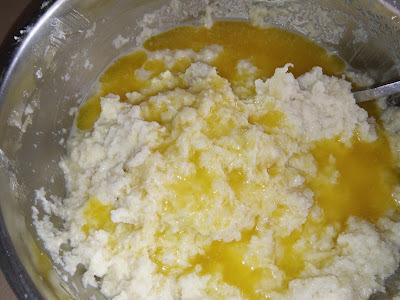 Lastly add in melted butter, mix well. Pour into baking container and bake in a preheated oven at 180 degrees C for about 1 hour or until cooked through [test with a skewer] and top is golden brown. 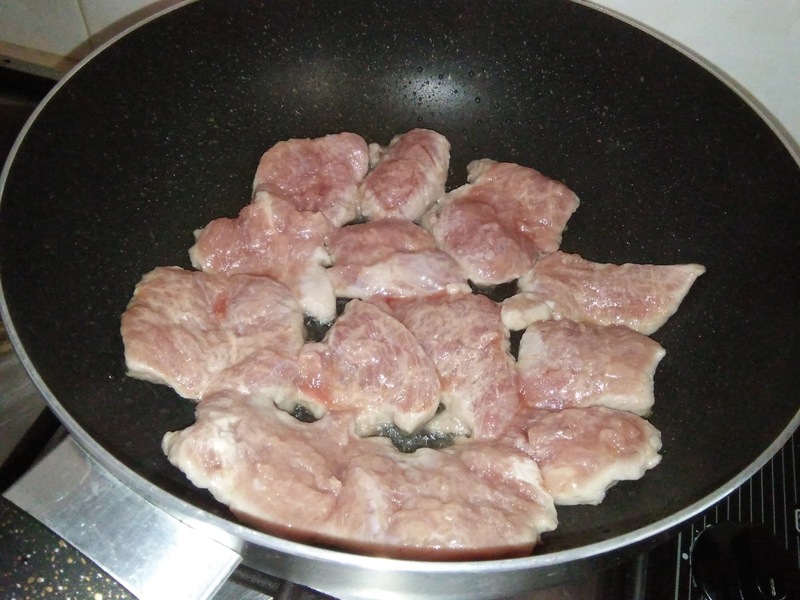 Remove to cool in the pan before slicing to serve. 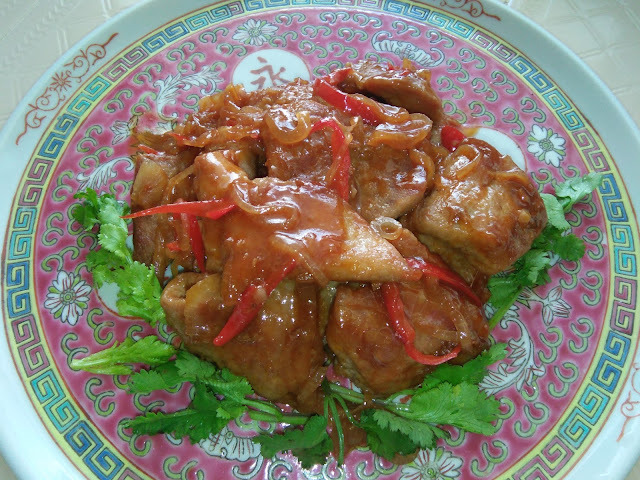 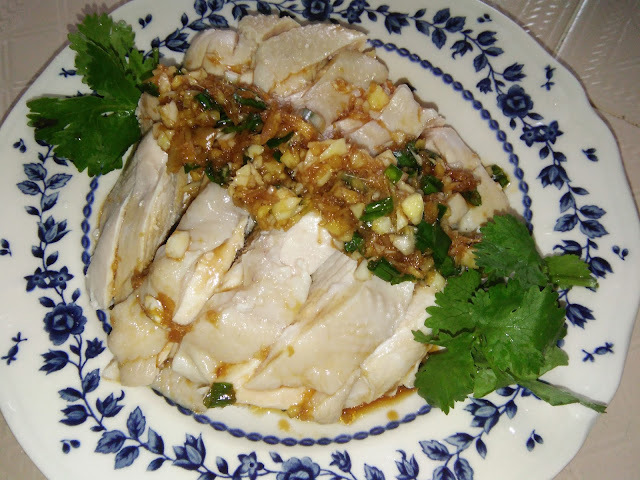 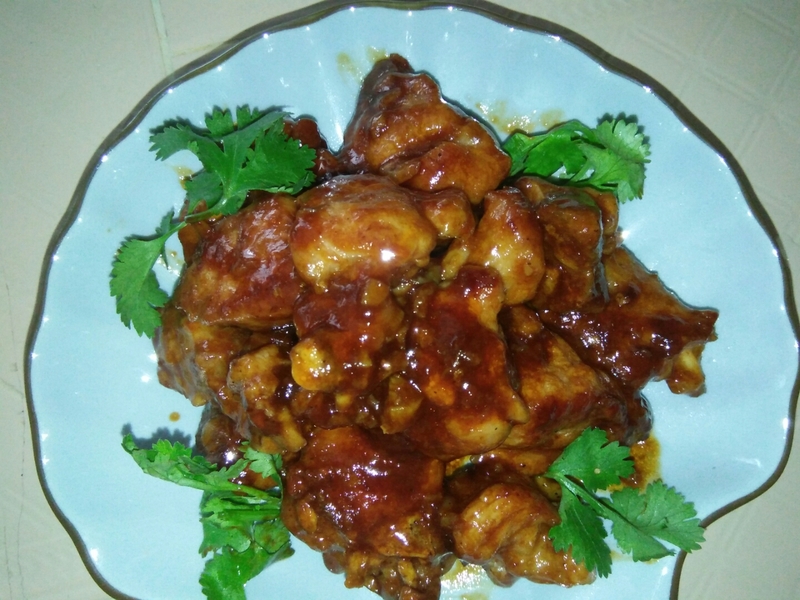 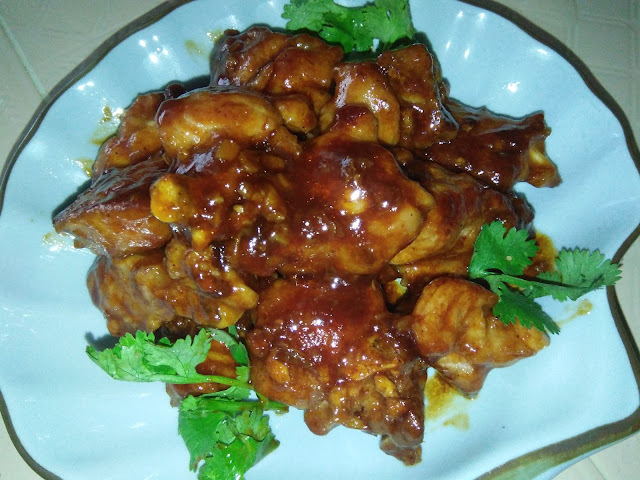 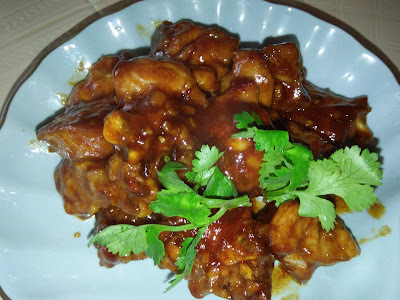 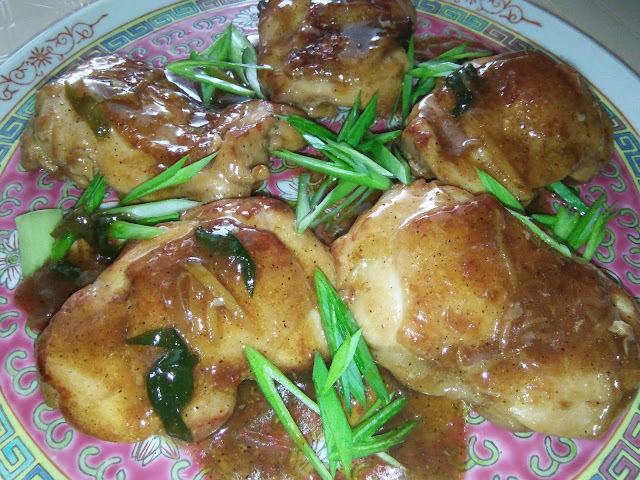 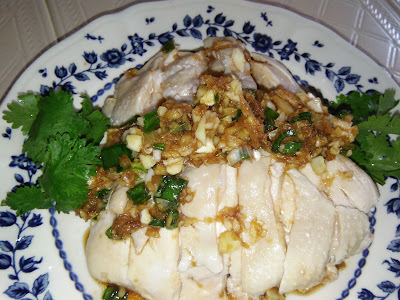 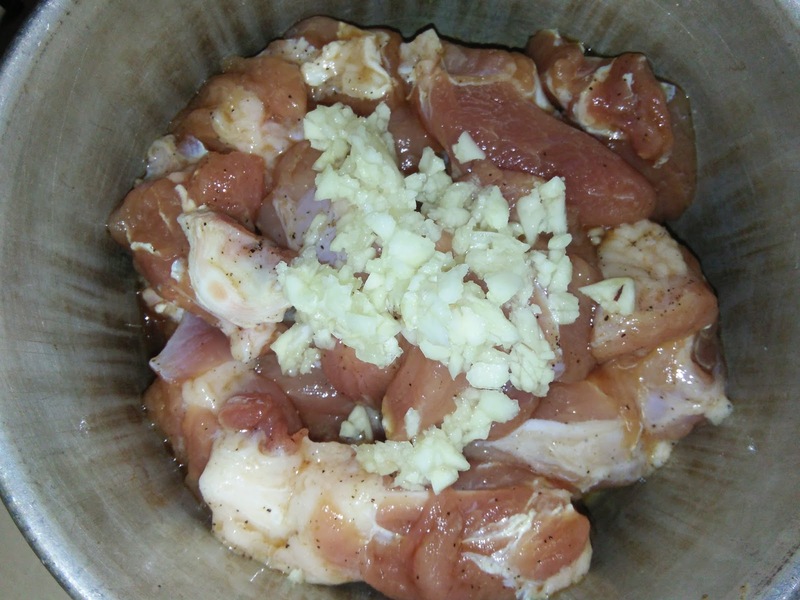 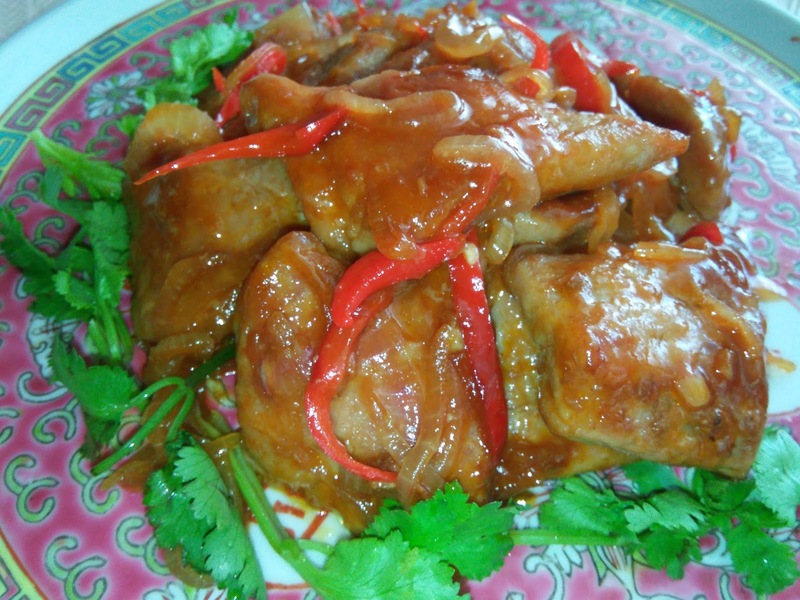 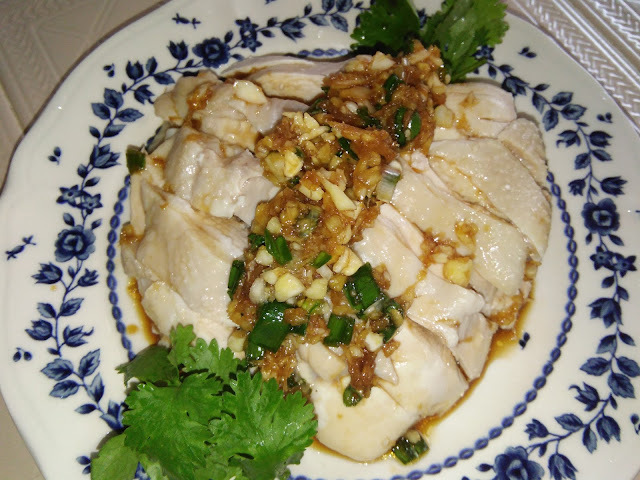 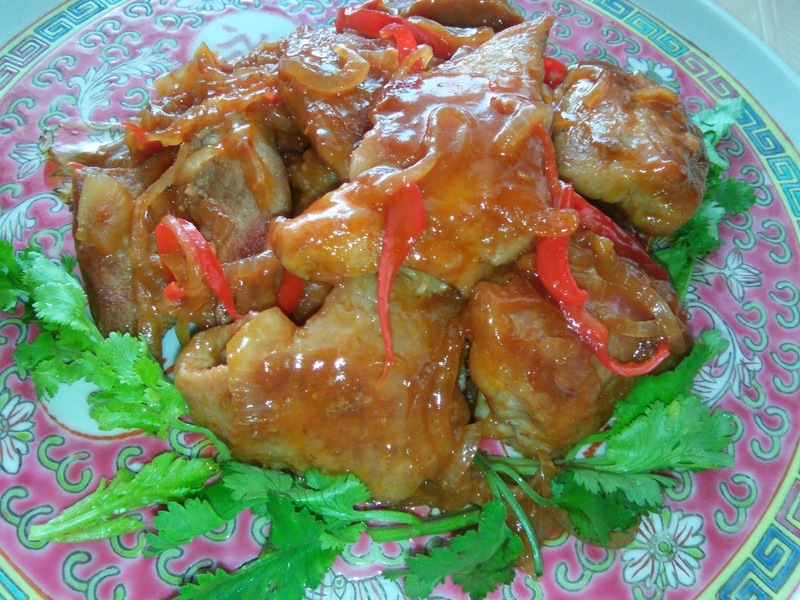 Another simple chicken dish with fragrant tasty sauce. 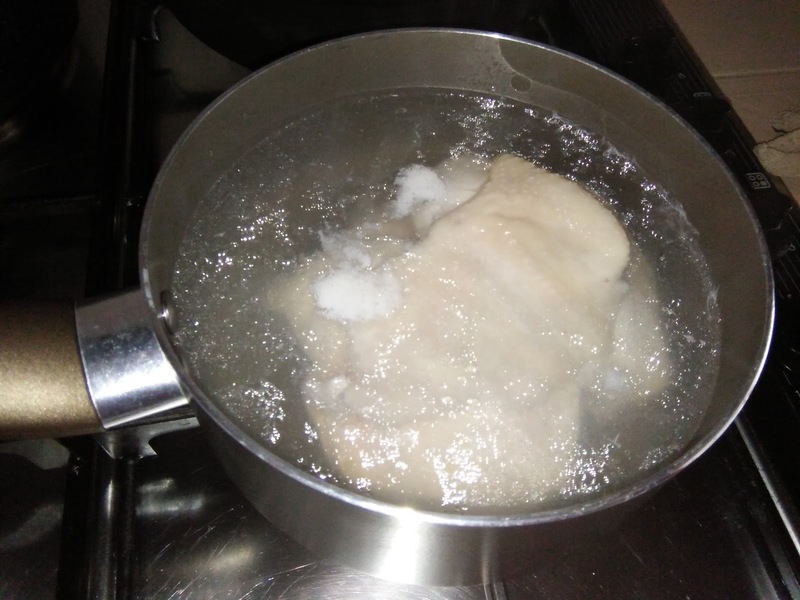 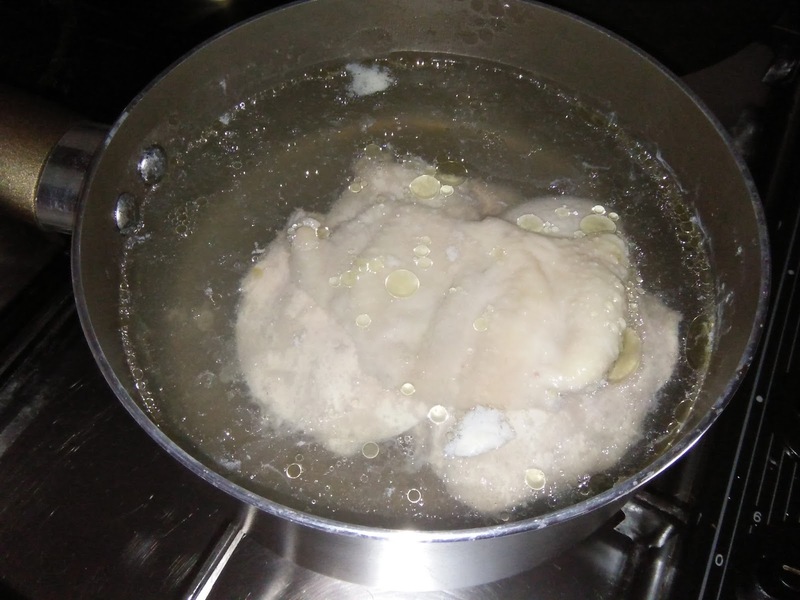 The original recipe uses chicken wings which has too much skin, so I have replaced it with deboned chicken thigh where I can remove as much of the fats and skin as possible. 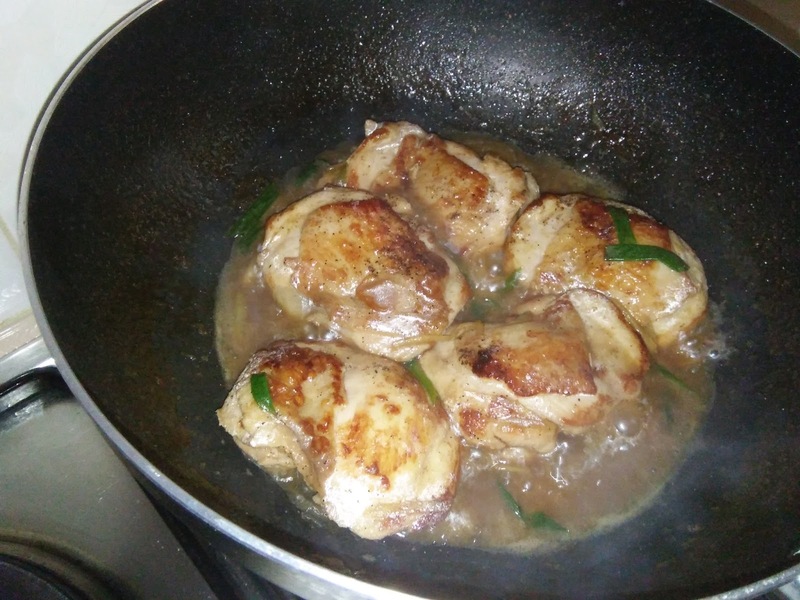 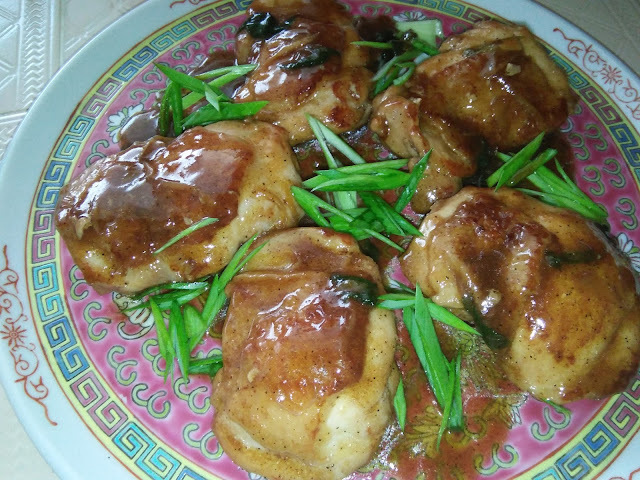 The chicken braised in oyster sauce with spring onions and ginger smells and tastes good. 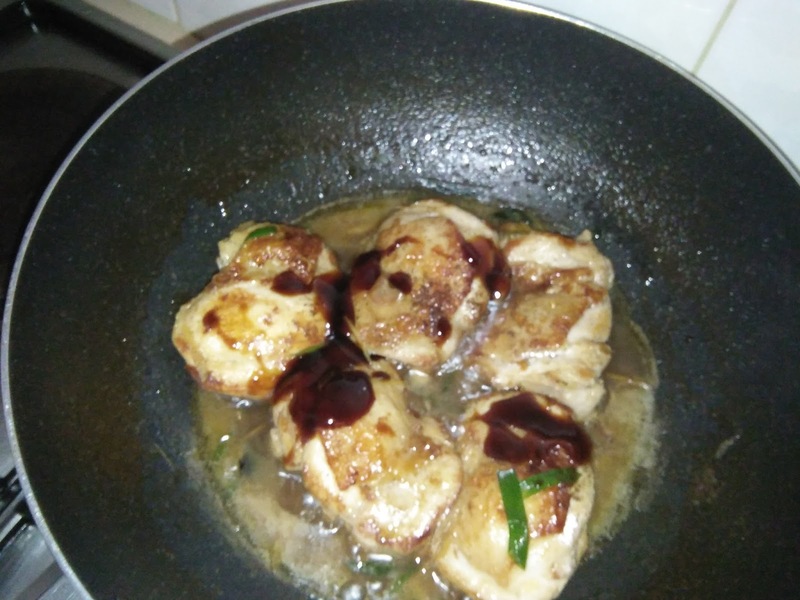 Yum, yum. 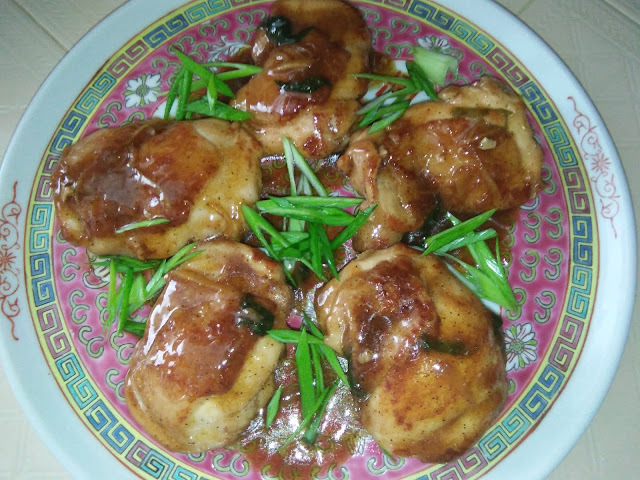 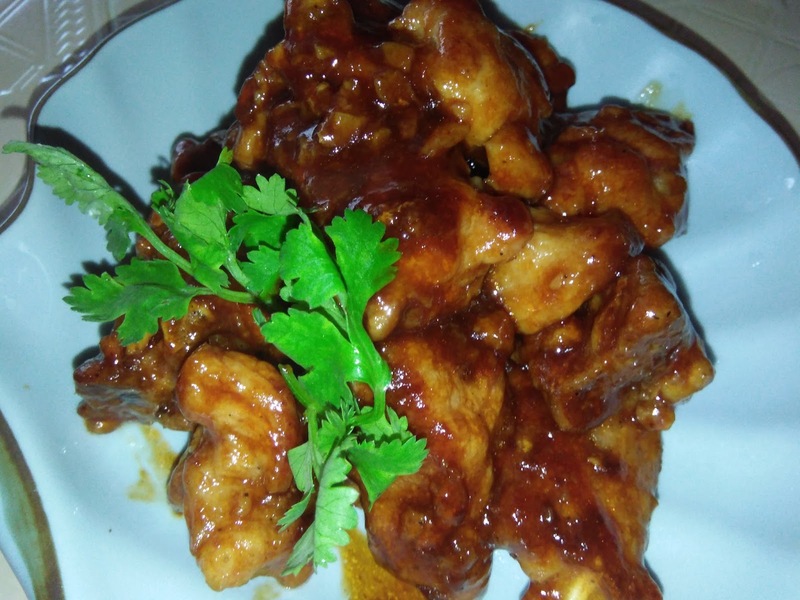 Season chicken pieces with light soy sauce. 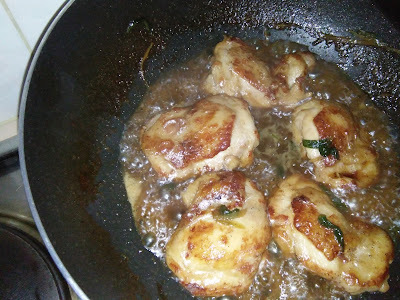 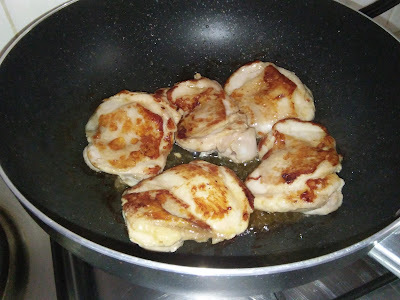 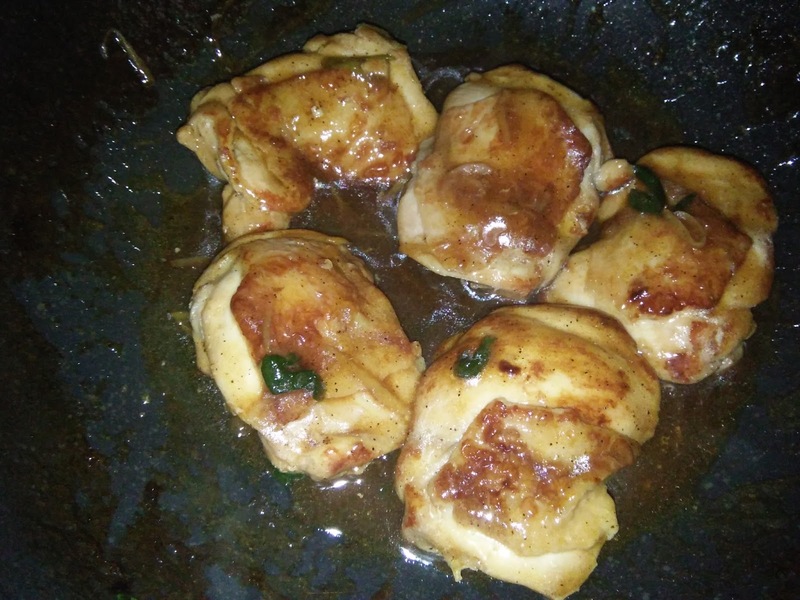 Deep fry or pan fry chicken until golden brown. 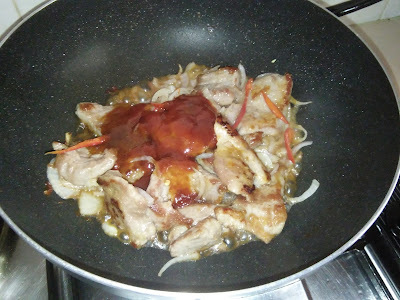 Push aside or dish up. 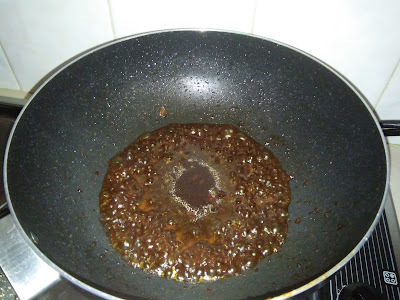 Remove excess oil. 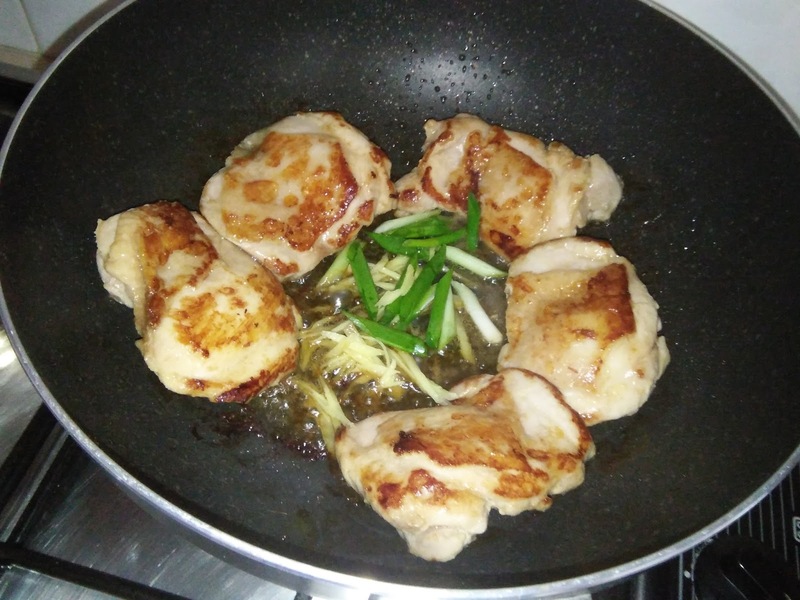 Using the same wok, sauté ginger and some spring onions until aromatic, add in chicken, 1 tsp wine and seasoning ingredients. Stir well and simmer over medium low heat for 15 minutes and sauce is reduced. 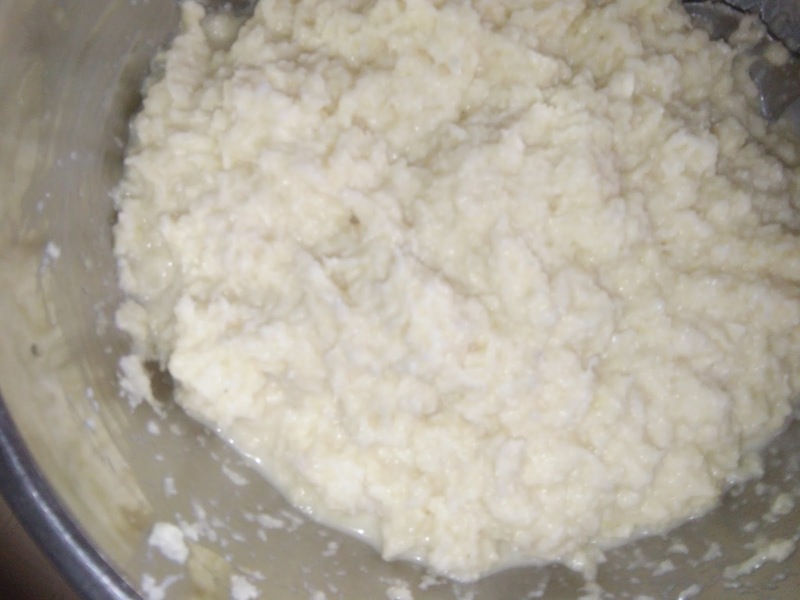 Thicken with cornstarch or omit if sauce is reduced to thick.